In this recipe, we’re exploring some specialty citrus. Kumquats are native to South Asia and the Asia-Pacific region and have been cultivated since at least the 12th Century. They closely resemble miniature oranges, but unlike oranges, the entire fruit (pith, peel and all) is edible and delicious. Here, you’ll cut the kumquats into rounds and stew them with shallots, Champagne vinegar and sugar to create a vivid relish. Its sweet-and-sour flavor cuts the richness of the crispy chicken, balancing the dish. Heat a medium pot of salted water to boiling on high. Once boiling, add the freekeh. Cook, stirring occasionally, 18 to 20 minutes, or until tender. Drain thoroughly and transfer to a bowl. While the freekeh cooks, wash and dry the fresh produce. 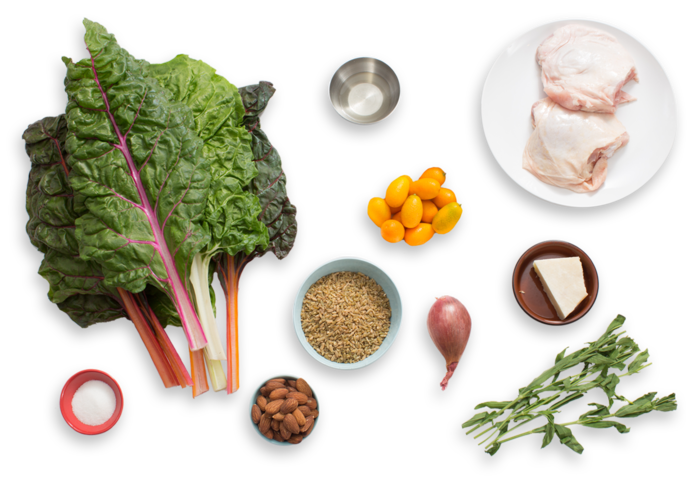 Remove the chicken from the refrigerator to bring to room temperature. Thinly slice the kumquats into rounds. Separate the rainbow chard leaves and stems; roughly chop the leaves and thinly slice the stems, keeping them separate. Pick the tarragon leaves off the stems; discard the stems. 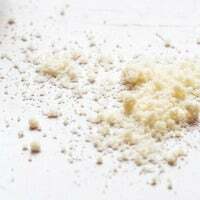 Using your hands or a small knife, break the pecorino cheese into small pieces. Peel and thinly slice the shallot. Roughly chop the almonds. 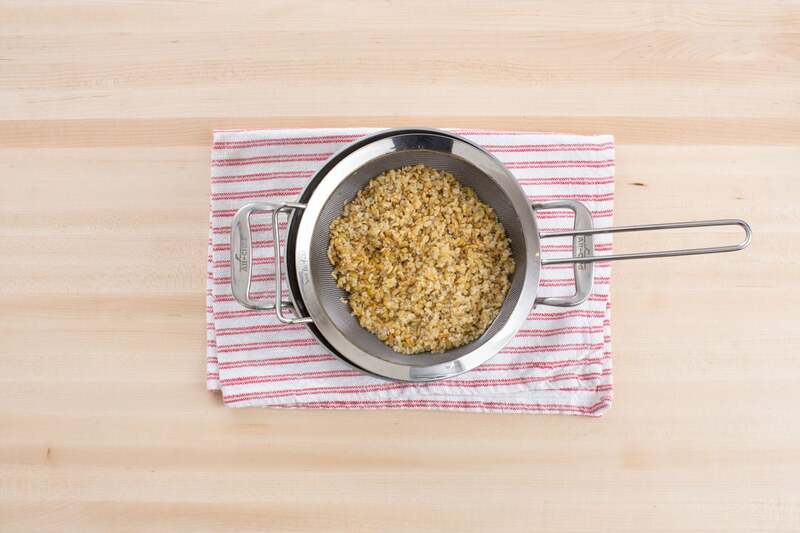 While the freekeh continues to cook, heat a medium pan on medium-high until hot. 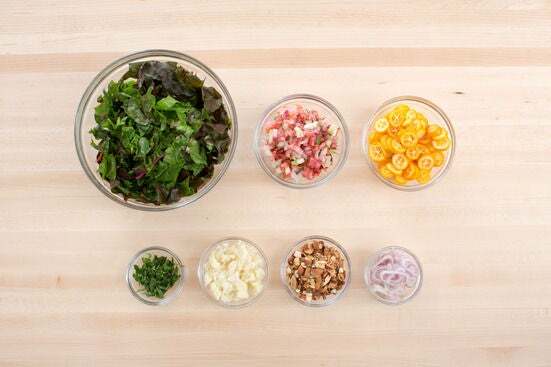 Add the kumquats, shallot, vinegar, sugar and ¼ cup of water; season with salt. Cook, stirring frequently, 3 to 4 minutes, or until the liquid has evaporated. Transfer to a bowl and set aside to cool. Wipe out the pan. While the freekeh continues to cook, pat the chicken dry with paper towels; season with salt and pepper on both sides. In the pan used to make the relish, heat 2 teaspoons of olive oil on medium until hot. Add the seasoned chicken, skin side down; loosely cover with aluminum foil. 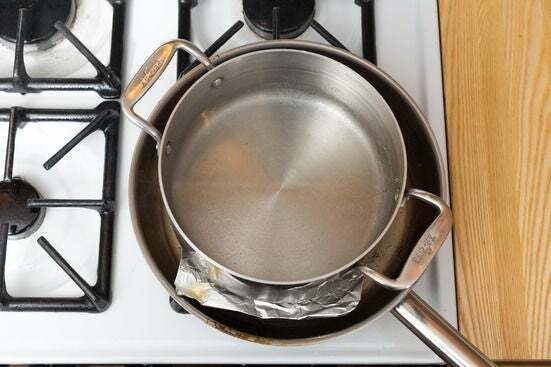 Place a large, heavy pot on top of the foil to press the chicken down; fill the pot halfway with water. Cook, occasionally pressing the pot down, 10 to 12 minutes, or until the skin is browned and crispy. Set the pot aside. Flip the chicken; cook 3 to 5 minutes, or until cooked through. Transfer to a plate, leaving any drippings and browned bits (or fond) in the pan. Add the rainbow chard stems and 2 tablespoons of water to the pan of drippings and fond. Cook, stirring frequently, 30 seconds to 1 minute, or until slightly tender. 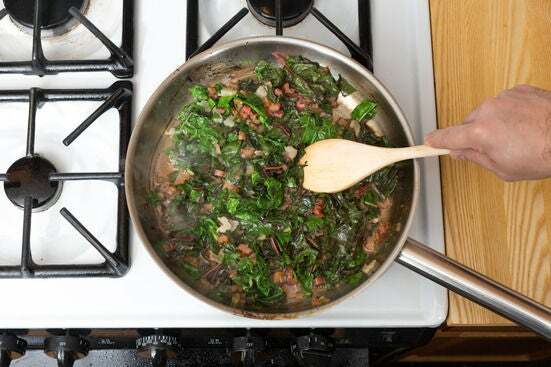 Add the rainbow chard leaves; season with salt and pepper. Cook, stirring frequently, 3 to 4 minutes, or until wilted. Transfer to the bowl of cooked freekeh. 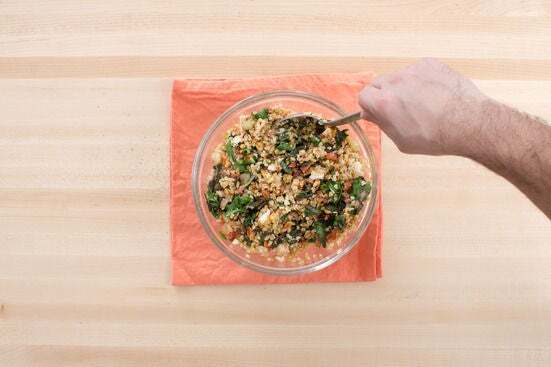 Add the pecorino cheese and almonds to the bowl of cooked freekeh and rainbow chard. 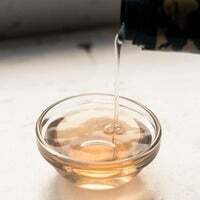 Drizzle with olive oil and toss to thoroughly combine. Season with salt and pepper to taste. 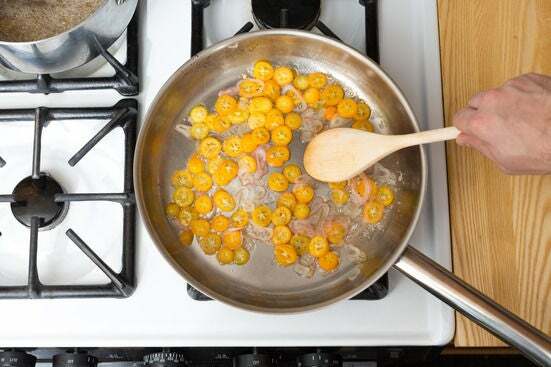 Stir the tarragon into the kumquat relish. 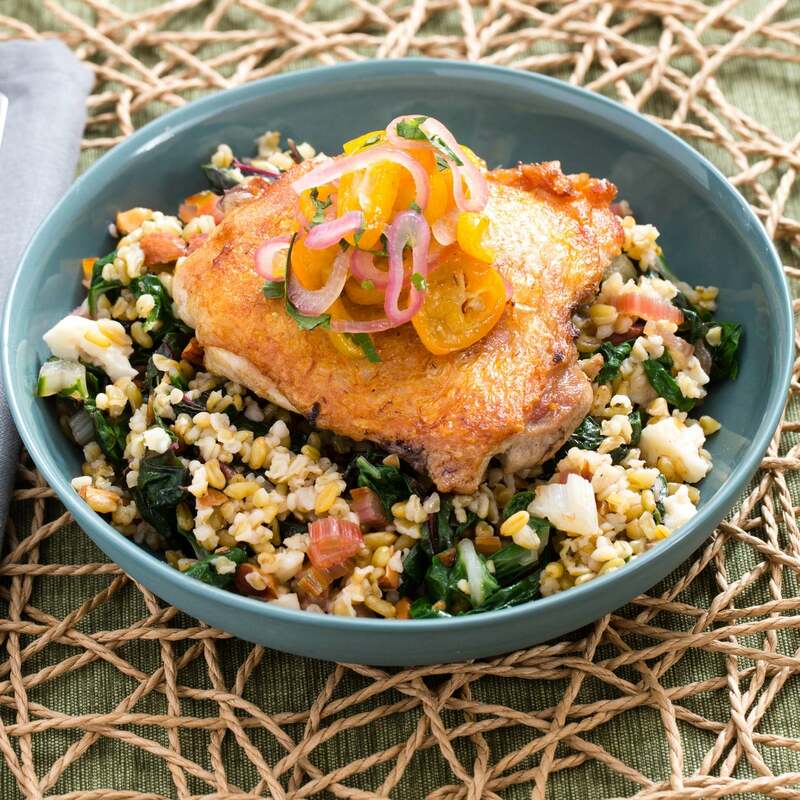 Divide the freekeh salad and chicken between 2 dishes. Top with the kumquat relish. Enjoy!